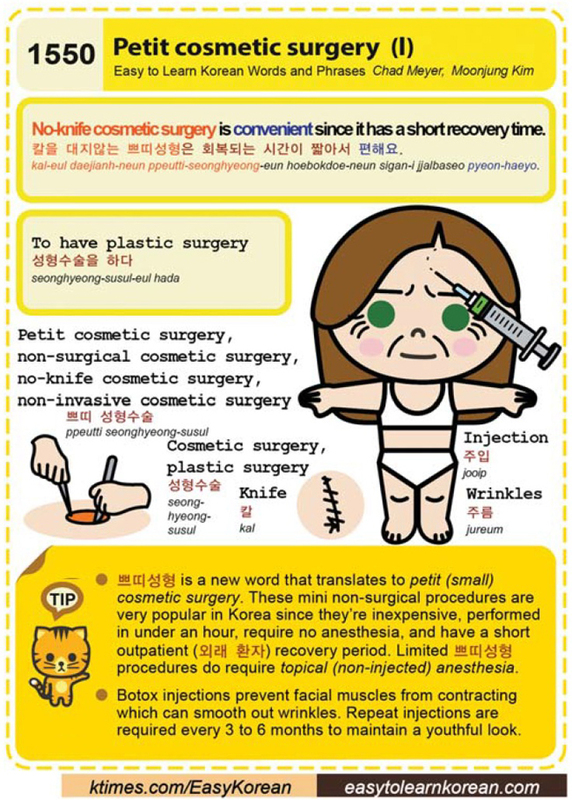 This entry was posted in Series and tagged anesthesia, Botox injections, cosmetic surgery, facial muscle, injection, Knife, mini non-surgical procedures, no-knife cosmetic surgery, No-knife cosmetic surgery is convenient since it has a short recovery time., non-injected, non-invasive cosmetic surgery, non-surgical cosmetic surgery, petit, petit cosmetic surgery, plastic surgery, plastic surgery monster, seonghyeong, short outpatient recovery period, small, surgery, susul, To have plastic surgery, topical, wrinkles, 쁘띠 성형수술, 쁘띠성형, 성 편견, 성형수술, 성형수술을 하다, 외래 환자, 주름, 칼, 칼을 대지않는 쁘띠성형은 회복되는 시간이 짧아서 편해요. by easykorean. Bookmark the permalink.